There’s something about Canada’s diverse landscape that calls to the outdoor adventurer in us all. Maybe it’s the rushing rivers, rugged coastlines or picturesque lakes. Sometimes, you can find all these things in one small town. Canada is a veritable paradise for outdoor enthusiasts who can choose from a wide range of activities, including whitewater rafting, skiing, hiking, canoeing and more. And let’s not forget that Canada is also home to breathtaking national parks and historic sites. This country offers ample opportunity to experience nature in all its glory. If you don’t have your Canadian passport, you’re probably not spending enough time with the laid-back locals and pulse-quickening adventures. There are many towns you can explore in this massive country. You may have heard of all the fun to be had in places like Banff, Nelson and St. Johns. If not, check out this post. Today, we’re going to cover some of the best spots for outdoor adventure that you may not have heard about. One visit to any spot on this list and you’ll see why Canada is the perfect destination for outdoor lovers. 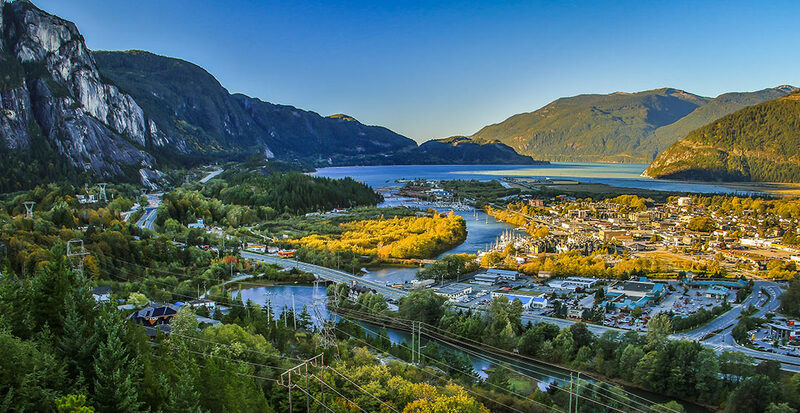 As the self-proclaimed “outdoor recreation capital of Canada,” Squamish was a natural for the first spot on our list. This is a popular spot for outdoor lovers in the summertime, but many people don’t know that Squamish holds a treasure trove of outdoor activities year-round. In the winter, you can enjoy some of the best Nordic skiing in all of British Columbia with over 100km of trails that have varying degrees of difficulty. And if you’re looking for a more low-key adventure, how about bird watching? Every winter, thousands of eagles descend upon Squamish to feed on spawning salmon. In the summer, you’ll enjoy some of the best hiking trails the province has to offer and intense rock-climbing opportunities with granite crags and incredible views. Squamish is where rock climbers go to put their grip strength to the test. Summertime activities in Squamish also include windsurfing, kiteboarding and whitewater rafting. And regardless of when you go, the Sea to Sky Gondola offers birds-eye views of Howe Sound and the surrounding mountains. About 80-miles north of Montreal, you’ll find Mont Tremblant’s cobblestone-lined streets and vibrantly colored buildings. This quaint village sits at the base of the highest mountain of the Laurentians, so skiing is an obvious draw. But it’s not the only thing to do in Mont Tremblant, not by far. In the winter, you may enjoy alpine touring, dogsledding, ice climbing, ice fishing, ice skating, snowmobiling and sleigh rides. The summer is considered the offseason, but it’s a beautiful time to visit the area. In the summer, you can enjoy mountain biking, canoeing, and kayaking, fly board, or take a dune buggy tour. Are you looking for some outdoor fun off the beaten trail? That’s usually the best kind of fun. Well, you might just love what Carcross has to offer. This small town is home to under 300 residents and spans only 0.29 square miles. You can pick from virtually any outdoor activity here, but the area is known for its mountain biking. Bike Montana Mountain, try your hand at gold panning at Caribou Crossing Trading Post, and then stop to see what’s dubbed as the “world’s smallest desert.” The Carcross Desert is actually a collection of sand dunes left by a glacial lake thousands of years ago. You can even sandboard here. If you’re looking for mountain biking in British Columbia, Comox Valley should be on top of the list. Not only is this area known for its biking trails, but it also dotted with wineries and farms to help you break up a day of activity. Comox Valley also offers acclaimed golf courses, cave adventures, alpine-to-ocean hiking and arguably the best view in all of British Columbia (from Mount Washington). Nordegg sits between the well-known towns of Banff and Jasper, but many would argue that Nordegg is a better vacation spot – especially for outdoor enthusiasts. This town sits along the Canadian Rockies where visitors can enjoy jagged peaks, a massive mountain bike trail network, a large mountain-lined lake, and the Saskatchewan River. Baseline Mountain has been host to XC and DH races, and there’s plenty of opportunity for whitewater canoeing. For days when you don’t want to get your heart rate up too high, consider some of the areas scenic hiking spots. Just being present in an outdoor paradise like Nordegg is nearly a life-changing experience. Regardless of what you decide to do here, you won’t be disappointed. Thunder Bay offers plenty for the outdoor enthusiast set amongst a city backdrop. While you’re here, set sail on Lake Superior, or visit provincial parks like Sleeping Giant and Kakabeka Falls. Sleeping Giant Provincial Park sits on the tip of a large peninsula that juts out into Lake Superior. If you’re an avid hiker, this is your destination. Many dub Sleeping Giant as the best hiking spot in all of Canada, which is saying a lot. Kakabeka Falls is a massive waterfall that’s often dubbed the “Niagara Falls of the North.” In the summer you can walk the trails along the canyon. In the winter, enjoy snowshoeing and cross-country skiing. For many reasons, Canada is the ultimate destination for outdoor lovers. So if you’re in for the road trip of a lifetime, gas up the car, grab a dependable GPS and head for the Great White North.